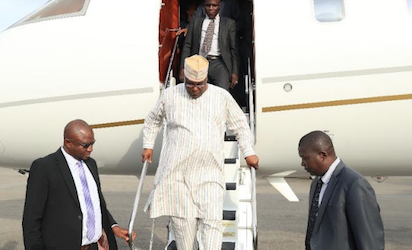 Presidential candidate of Peoples Democratic Party, PDP, Alhaji Atiku Abubakar, was expected to arrive in Washington, DC, yesterday, TheCable can report. The former vice-president is reportedly scheduled to speak at the Chamber of Commerce today, from 2:30 pm to 4pm local time, although the event could not be confirmed the event. He was scheduled to be in Ogun State yesterday morning but the event was cancelled. TheCable had exclusively reported in December 2018 that Atiku had been issued with a US visa for the first time in 13 years. Atiku is expected to hold consultative forum with Nigerians in diaspora, as TheCable initially reported.